اختر لغتك المفضلة. نحن نتكلم العربية و 5 لغة أخرى. Your privacy is important to us. 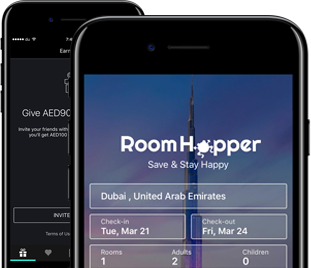 RoomHopper is in control of the data entered and obtained during the course of your use of the site as well as making a booking. The following policies and terms disclose the way in which we gather and share information of users on our site. This information is necessary for us to be able to complete our service and make your booking, send you details and conformation and if relevant inform you of any changes/updates. If there is a problem processing your request having this contact information allows us to get in touch with you. Telephone numbers are only used if there is a need for urgent contact. Your card information is used for billing purposes and to complete your booking. We may also use your contact details to inform you of our products and services, including special offers that we think may be of interest to you. To stop receiving emails from us you can click the unsubscribe link at the bottom of the email. We do not pass details of your personal information to third parties except as disclosed in these terms. Your information is stored for as long as is necessary for us to process your booking, comply with legal obligations or to keep you informed of our products. Your information may also be used to create data, which we then use for internal analysis in order to improve our service. This data does not identify you personally and is only used statistically. In order to protect and safeguard the personal data provided to us, we have implemented and use appropriate business systems and procedures. For example, your credit card information is transmitted to us through a secure server protocol, which encrypts all your personal and credit card details. The encryption method used is the industry standard "Secure Socket Layer" (SSL) technology. Our SSL certificate has been issued by Globalsign: www.globalsign.com. Furthermore, we have implemented and use security procedures and technical and physical restrictions for accessing and using personal information. Only authorised employees are permitted to access personal information for performing their duties in respect to our services. Our server and network are protected by firewalls against unauthorised access and we have intrusion detection systems that monitor and detect unauthorised (attempts to) access or misuse our servers. Pleas note your credit card details will not be stored, we do not save your credit card payment information. iii Our affiliates, partners, contractors, those hired by us to perform services and other relevant third parties When you are paying by credit/debit card we pass your card details to our merchant account provider for authorization of the transaction and processing of the payment. Apart from these conditions and circumstances mentioned we do not disclose your details to any third parties, nor do we disclose your details to any other parties without your consent except in the case of an emergency that dictates the need to do so or if we are legally obligated to do so. We use IP addresses to help diagnose problems with our server and to analyze trends/administer the site/track user's movement for our internal site traffic statistics. The data that we collect from you is stored on our secure servers. Only RoomHopper and our relevant employees and service providers have access to these servers. No unauthorised third parties have access to these servers without our consent. Cookies are in use by RoomHopper in order to monitor which parts of the site are most appealing to our users and to help remember preferences. Cookies are pieces of data stored on your computer and this usage is not linked to any information that is personally identifiable during the usage of our site. We may allow add network companies to deliver advertisements on our behalf. We do not provide any personally identifiable customer information to these companies except under the terms of this privacy statement. If you wish most browsers allow you to turn off cookies in the preferences menu, however we do not recommend this as it may impair your ability to book with RoomHopper and is in use by almost all similar sites. This site contains links to other sites. RoomHopper is not responsible for and has no control over the privacy practices of these other sites as such this privacy statement applies solely to information collected by this site. Please check the privacy policies corresponding to such sites before submitting any personal information to them. We do not accept any responsibility or liability for anything conducted on these sites. This site has undertaken security measures in order to protect the loss, misuse, and alteration of the information that we receive and use. We employ the use of Secure Socket Layers (SSL) to ensure the privacy of the information provided to us. We ensure that your debit/credit card details are never transmitted unencrypted over the Internet. In addition to this we have several measures in place that include firewalls and other anti-hacking security systems, network segmentation allowing restricted access to stored profile information and encrypted and password protected access to all sensitive areas of our databases. In addition we take care offline to ensure all of your information that we process is always secure and strictly accessible only by authorized members of our company who have restricted access only when needed to carry out a particular task. Our policies and security measures are monitored to ensure our employees understand and adhere to our security protocol. By using this site and making a booking with us you agree to our privacy statement that is active at the time of your most recent booking. This shall apply to all your information whether given to us at the time of that booking or when making previous bookings the event that RoomHopper amends and makes changes to this Privacy Statement, such changes will be in place in a later version of our site and such announcements will be made on the site giving adequate notice. © 2019 RoomHopper.com. جميع الحقوق محفوظة. استخدام هذا الموقع يشكل قبولا الشروط والأحكام و سياسة الخصوصية .